Written by G. W. Bruehl for the Washington State University centennial anniversary, this work contains a great deal of interesting information about the department, Washington State University, and the State of Washington. 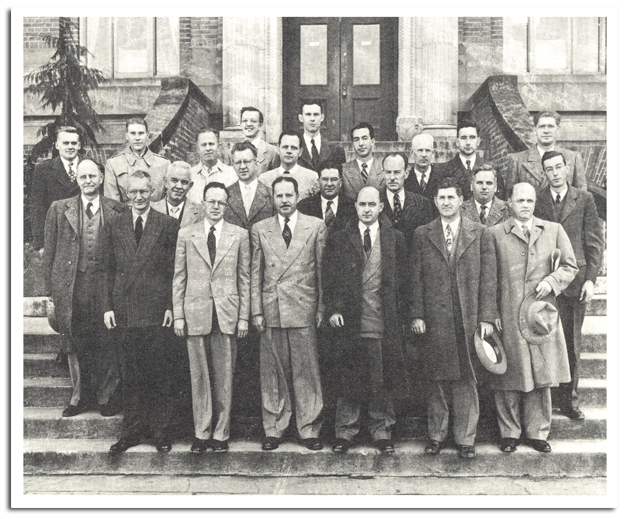 Picture taken at the Washington Agricultural Experiment Station Conference, November 27, 1950. Front row, left to right: H.B. Busdicker, C.J. Gould, G.W. Fischer, R.C. Lindner, D.M. McLean, Folke Johnson. Second row, left to right: M.R. Harris, W.D. Courtney, S.B. Locke, Roderick Sprague, Leo Campbell, A.E. Rich, J.D. Menzies. Third row, left to right: W.D. Yerkes, J.P. Meiners, R.C. Cummings, S.W. Graham, H.E. Williams, E.C. Blodgett, T.O. Diener, J.G. Barrat.